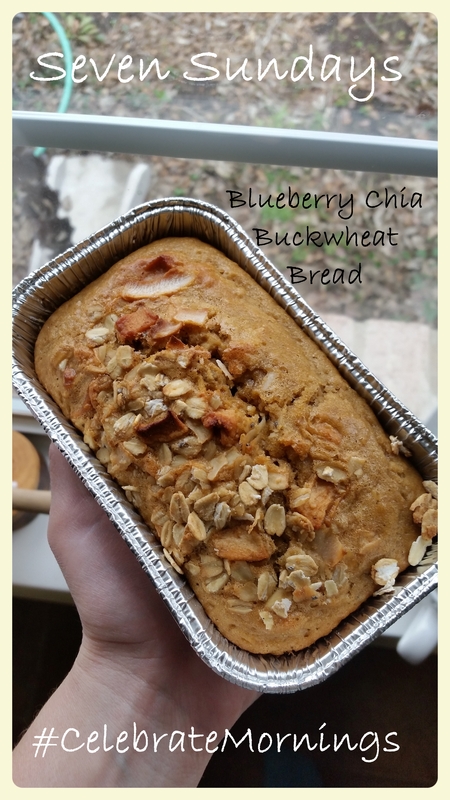 I’ve been so excited about Seven Sunday’s latest flavor Blueberry Chia Buckwheat to come out. It was released this past weekend in Targets across the nation! I have several GFF’s (gluten free friends) 🙂 So I decided to get right to the kitchen and start experimenting with a little somethin’ somethin’ and this is the result! It turned out great and I can’t wait to make it again in a larger batch. Cook Time: 30-40 min or until done. Makes: 2 mini loaves (you can make more, I just started small to not waste if I didn’t like it). 1/2 Cup Milk (you can use any kind, I used 2% dairy). Cream sugar and oil together, I used slightly above room temp coconut oil so that it has a shortening consistency. Add eggs and milk and mix until incorporated. Mix Flour, Salt, Baking Powder well in separate bowl, then mix the two together adding the 3/4 C. Seven Sundays and blueberries last, being gentle with them. Add mixture to two small bread loaf pans and sprinkle with a dash of remaining Seven Sundays on top. Bake for 30-40 min or until a toothpick can be inserted and removed cleanly. Enjoy with some local honey or butter OR even better… BOTH! This is one of my favorite comfort food dishes! After moving quite a ways away from Shady Grove in Austin- Evan and I started making our own (about once or twice a year). If you can’t make it there this should cure your craving! 2.5 C. Flour seasoned with salt and pepper. 2.5 C. Corn Tortilla Strips, sliced thin. 6 oz Chili Con Queso, I like to make a green chili variety. Whisk the lemon juice, hot sauce, salt, and pepper together in a shallow bowl. Dip each fish fillet in the lemon juice mixture. Dredge fish in seasoned flour, followed by buttermilk, and then corn tortilla flakes to coat completely. *I make the hubby my Fry Daddy, and usually request him to do it outside… 🙂 Pour peanut oil into a large, deep saute pan until it comes about halfway up the sides of the pan. Heat oil to 350 degrees F. When oil is hot, carefully add fish fillets to pan, in batches if necessary, and deep-fry until golden brown, about 10 minutes total. Remove from the oil and drain on paper towels. 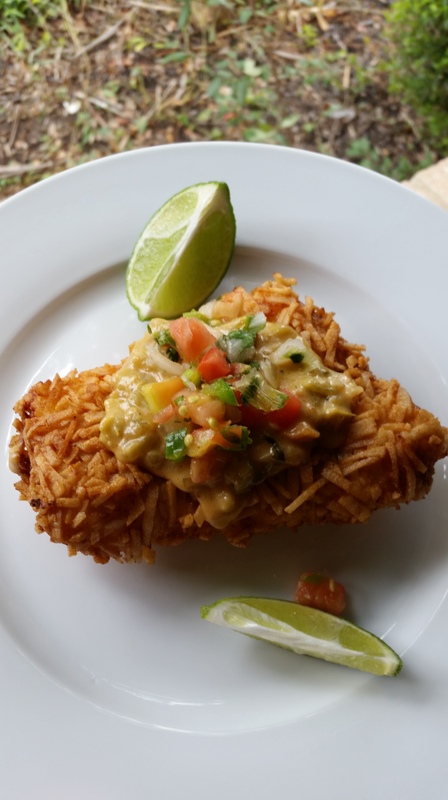 Place a drizzle of queso on top of each fried fish. Then top with pico de gallo on top of the fish. Garnish with a lime wedge and serve. We recently had the pleasure of hosting the first ever Floyd Piano Company Yoga and Brunch Club! It was great fun and so nice to have yoga, piano, and delcious Seven Sundays breakfast under one roof in a absolutely beauftiful space. 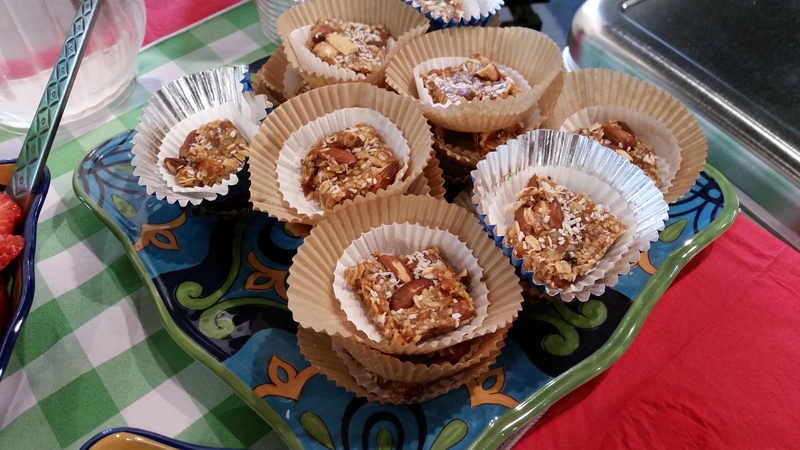 Lori Floyd made these delicious Seven Sundays Muesli bars that were a big crowd pleaser. Since so many people asked for the recipe she was kind enough to send it my way! Thanks Lori! Looking for Seven Sundays near you and cannot find it? They do $5 flat rate shipping for as much muesli as you care to order 🙂 Order here. Several depending upon how you cut them up. 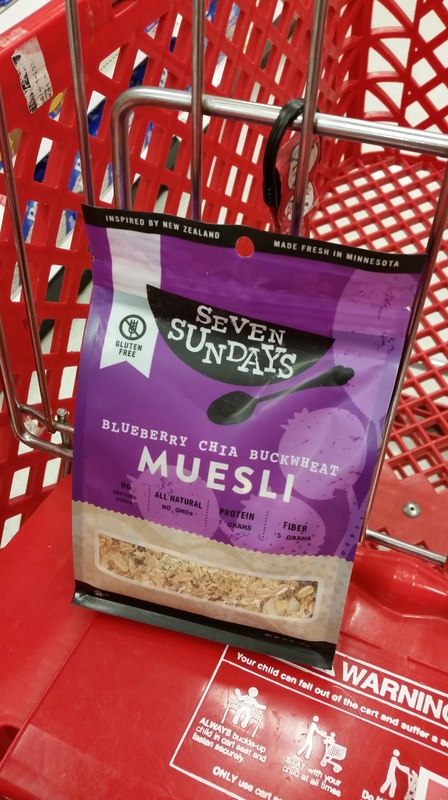 1 box favorite Seven Sundays Muesli (She used Cherry Vanilla Pecan). Warm almond butter and honey in small saucepan and add extracts and salt. Soak dried fruit (She used mango) in water for 15-20 minutes if not already gooey in texture. This will ultimately help hold bars together. Strain and add fruit to food processor and pulse until nearly a fine chop. Add muesli, nuts, coconut and fruit to large bowl and pour butter mixture over. Mix well. Place plastic wrap on bottom of 9×13 baking dish. Pour mixture into pan and press until evenly distributed. Cover with plastic wrap and place in freezer for at least 20 min or place in fridge for at least an hour. When bars are set, move to cutting board and cut into portion size of your choice. She likes to keep in freezer for a little more of a firm bite. Will keep for 2-3 weeks. Obviously the nut, fruit and butter choices are endless, but she used almond, mango and coconut with the vanilla cherry pecan muesli. Coconut and honey is also optional. Super easy and delicious. Enjoy! You are going to LOVE this spread, it’s super simple to make and so delicious!!! It’s good on crackers, veggies, or toast. Bring this to a party or event and people will love you… seriously be prepared to make it over and over. 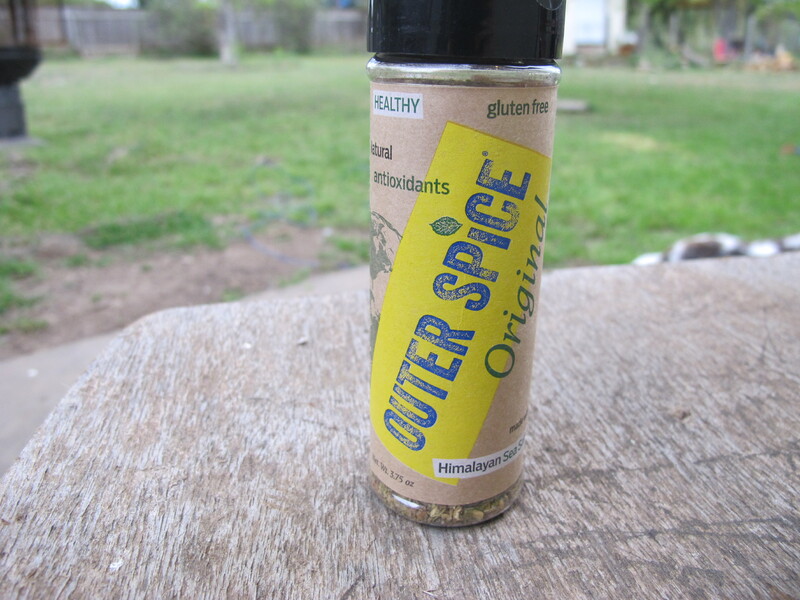 Outer Spice is a locally owned business from Austin Texas that makes blends from the finest, quality ingredients that they hand select themselves, from around the world. They combine fresh herbs and spices in small artisan batches to create the most versatile combination of flavors. 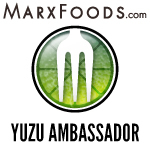 Their products are all-natural, Gluten- free, rich in antioxidants and have NO MSG! 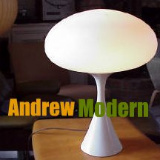 They are also Fair Trade, doing business with farmers and traders that practice Fair Trade!!! My kind of company! So many spice blends out there have MSG in them, beware of it’s full name: monosodium glutamate, it’s bad stuff! You can rest assured of the quality behind this blend. Makes: Approx 1 1/2 Cups of spread. 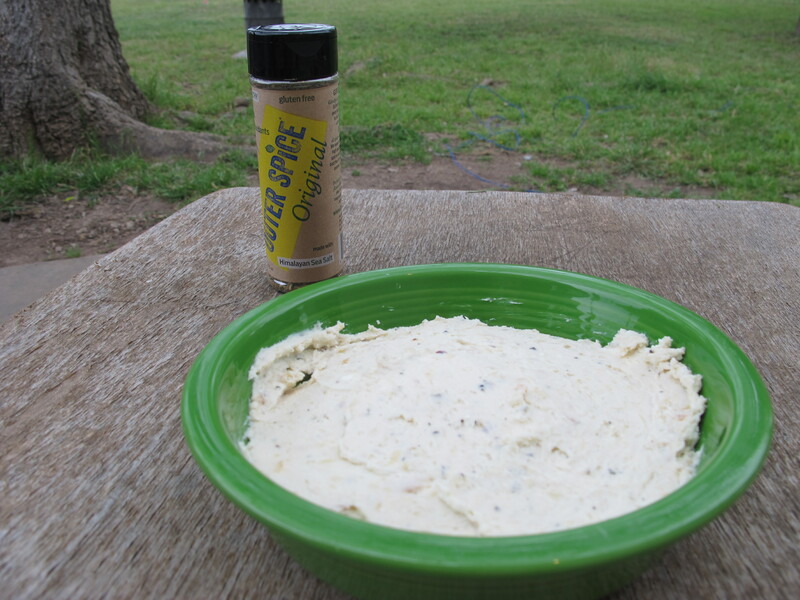 1 TBS Outer Spice Original or more to taste. Oil (you can use olive, coconut, whatever you prefer). Cut tops of garlic bulbs and add a little oil to the tops. Wrap in foil and I place in the oven for 35-45 min or until golden. Let cool when done or use paper towel to handle as you squeeze out roasted garlic cloves. Watch for bits of the outer layers. 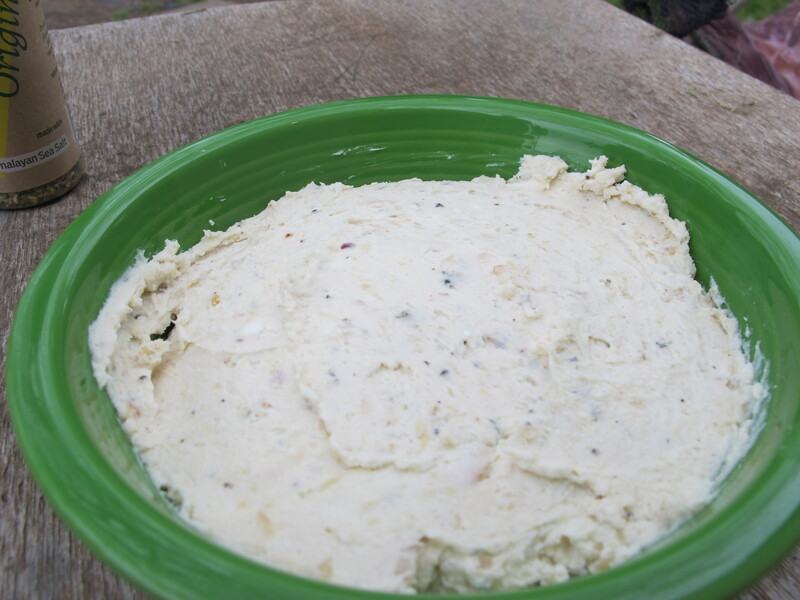 Mix goat cheese, garlic, and Outer Spice. This is SO delicious! 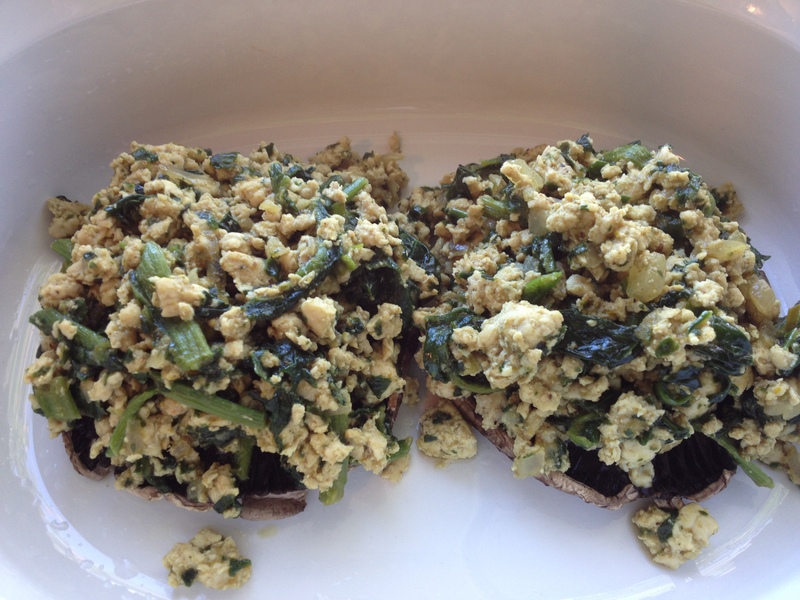 This is a great brunch meal for the holidays! Pie Dough: Use your favorite recipe or if you must do a pre-made one. Take pie crust and press into pie pan, set in fridge while you prepare the rest. You will want to use a deep dish pie pan thats greased. In a large skillet cook bacon until browned. Reserve 1/2 of the grease and removed bacon from pan. Then cook onions, spinach, and mushrooms until soft. Then add artichokes. Reserve. In a large mixing bowl crack 7 eggs and beat, then add cream, mix well. Add a pinch of salt and pepper. Then carefully add the cooked mixture of spinach, onions, bacon, and artichokes to the egg mixture. Stir and then gently pour into pie pan. Bake for 1 hr covered with a foil tent for about 40-45 min and then uncover for the remaining time until cooked through. Bake at 400F. I’m on a Hatch Chili kick as you can see. Here’s another good and wholesome unprocessed meal that’s gluten, GMO, and dairy free that has hatch chilies!!! 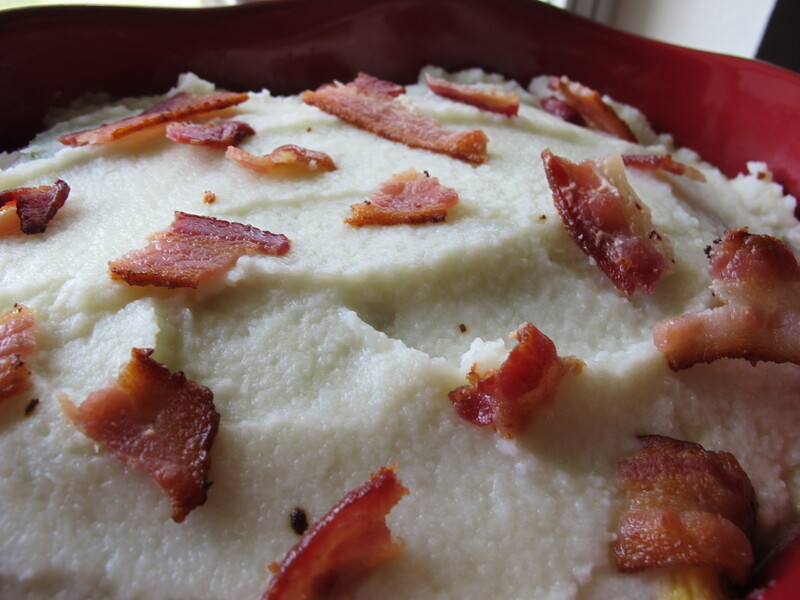 Unlike your typical shepherd’s pie, I used cauliflower in place of potatoes and threw a sprinkle of bacon on top since everything is better with a little bacon! 2 Slices of Cooked Bacon (Nitrate and preservative free), chopped. 1/2 Cup Coconut Milk (you can use lite if you’d like). 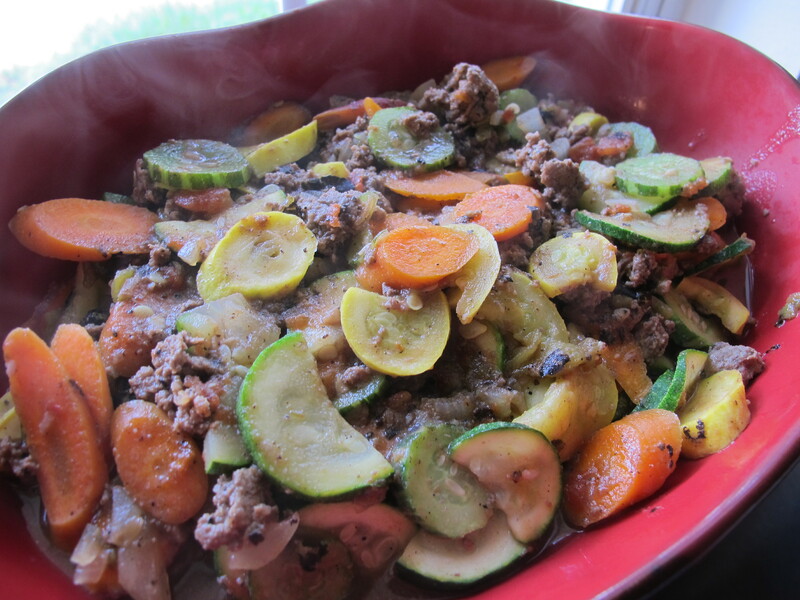 In a large skillet or dutch oven, brown meat with onion and garlic until brown, once brown add stock and all veggies EXCEPT cauliflower and 1 tsp of salt and 1/2 tsp. of pepper. Cook for 15 min on low to simmer. Taste and add salt and pepper if needed. While Mixture is cooking, bring a large pot of water to boil and cook cauliflower until done. Blend/pulse in a blender with 1/2 Cup Coconut Milk and add salt to taste. (Think mashed potatoes)! (You can add butter if you would like here, like a TBS). In a medium casserole and meat and veggie mixture and top with cauliflower puree, spread evenly. Top with bacon. Save to bake later: Wrap with foil and place in fridge. When you are ready to re-heat heat oven to 350F and cook for 25 -35 min or until hot in middle. If you are cooking right away heat oven to 350 F and cook for 10-15 min. This is a fun spin on chicken enchiladas and if you are looking to eliminate processed/GMO foods (like corn tortillas) you will love this. This is ALMOST a dairy free version and can easily be dairy free with one tweak., don’t add the cheese 🙂 It’s also gluten free. I’m in love with hatch chilies and I always look forward to August when they come out! 2 Chicken breast, cooked and shredded. Get pasture raised chickens. 3 Hot Roasted Hatch Chilies and 3 Mild Roasted Hatch Chilies, remove the top. 1 Organic Purple Onion, small (about 1/4 Cup). 1 Organic White Onion, small (about 1/4 Cup). 1/2 C. Organic Coconut Milk (you can use lite if you would like). 1/2 Teaspoon of Celtic Salt. 1 or 2* Organic Sweet Potato, sliced thinly long ways on mandolin. 1 Teaspoon of organic coconut oil for baking dish. OPTIONAL: Kerrygold Cheddar Cheese (Grass Fed Cow Cheese) for topping the enchiladas if you desire. Blend up hatch chilies, onions, garlic, coconut milk, and spices in a blender until consistency of salsa. Cook on med / low for 25 min. Bring a large pot of water to boil. Add sliced sweet potatoes to boiling water and cook for 6 min. Drain and set aside. Reserve 1/2 Cup of hatch chili salsa. Mix chicken into the remaining large portion of salsa. Add chicken and salsa mixture to each potato and top with another slice of potato. Once you are done take the reserved salsa and put a little bit on the top of each potato enchilada then sprinkle with cheese. Either reserve dish to bake later or bake NOW at 300 F for 15-20 min. If you are waiting for later, heat oven to 375 F and bake for 30 min or until warm all the way through. This is an awesome and simple meal that’s full of flavor and a heat, a good heat… not too long lasting but just right. 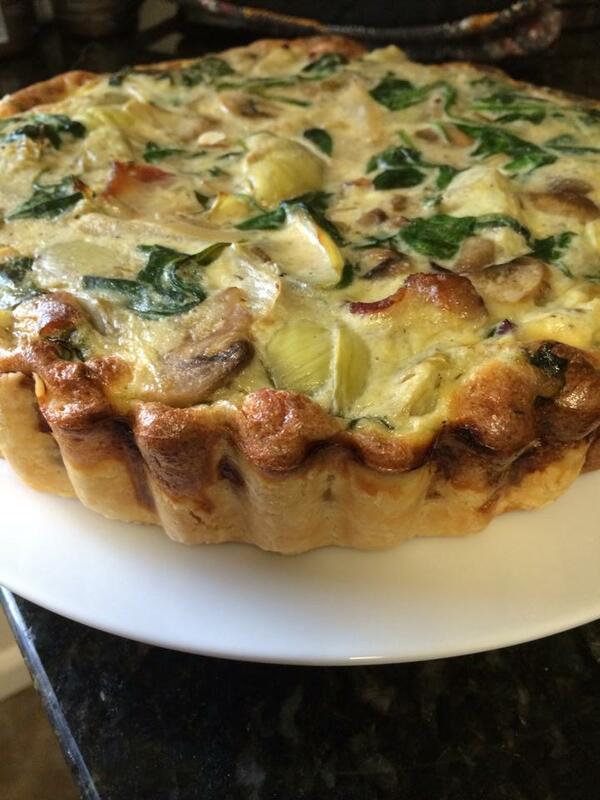 This is a good dish to prep early in the day and cook later on for dinner! It’s under 400 calories (about 375 ), approx: 19 grams of fat, 40 grams of protein, 4 grams of fiber, and under 10 carbs (mainly complex). 1 Cup Organic Spinach Packed (Fresh or frozen will do). Steam Portobello caps for 6 min. Pat dry with paper towel and set aside. In medium skillet on medium high, add coconut oil, onion, and garlic. Cook for 30 seconds. Add ground chicken breast and cook until 90 % done or so. Add curry paste and coconut milk and reduce heat to low, simmering for 10 min. Stirring often. Place a mound of the chicken mixture onto each cap. If you are cooking immediately preheat oven to 350F and bake for 10 min. If you are cooking later, place meal in fridge until ready to cook, when ready, preheat oven to 375 F and cook for 20-25 min or until hot. Top with a pinch of chopped cashews. Evan and I started a 90 Day Challenge Saturday at our gym to get back to our healthy living habits! We have been “slacking off” I guess you could say and not feeling as good as we could and should. You will be seeing more “healthy meals” over the next few months so I hope you enjoy. My main goal is to eliminate as much processed food as possible from snacks to pasta and everything in-between. I’m usually really good at this but lately I’ve been a SLACKER!!! We really enjoyed this meal last night. 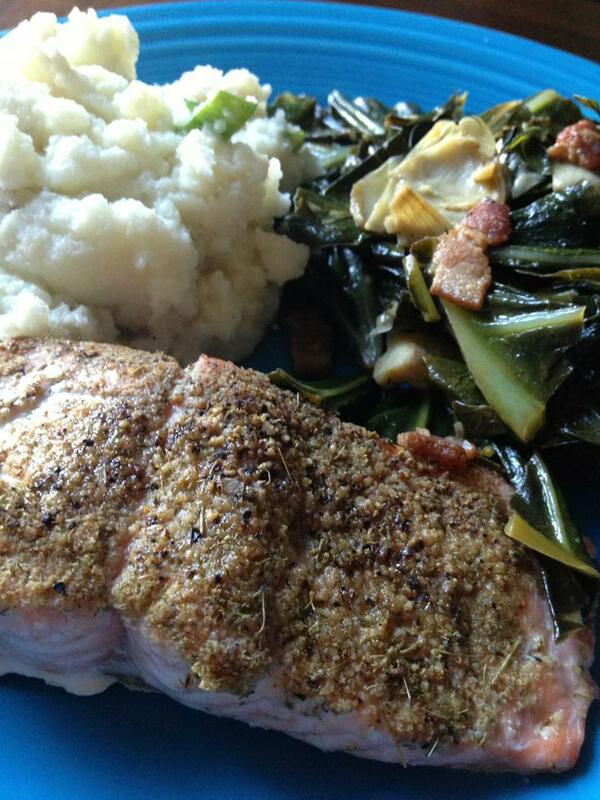 8oz Wild Coho Salmon (cut into two portions). 1 Bunch of Collards, stemmed and chopped. 1 oz of Farmer’s Cheese (you can omit if you don’t do dairy). Wash fish and make sure scales and bones are non existent. Pat dry. Mix dill pollen, garlic, salt, and pepper on a shallow plate or bowl. Rub 1/2 tsp of coconut oil on each portion. Place fish side down on spice blend and coat evenly. Bake for 20-25 min or until done to your liking. Cut up bacon with cooking shears, cook until 80% done. Drain grease from pan and with same pan on medium heat, add garlic. Cook for 30 seconds. Add bacon back in and rest of stock, cover and simmer on low for 15-20 min. 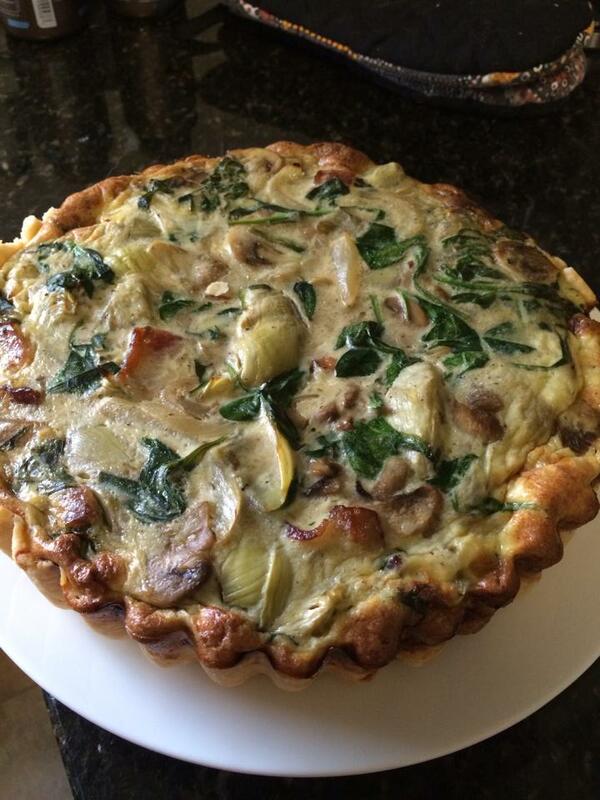 Add Artichoke hearts for last 5 min. Bring a medium pot of water to boil and cook cauliflower for 6 min. In a blender, blend cauliflower,stock, butter, cheese, and salt and pepper. You will LOVE this spin on an old favorite. 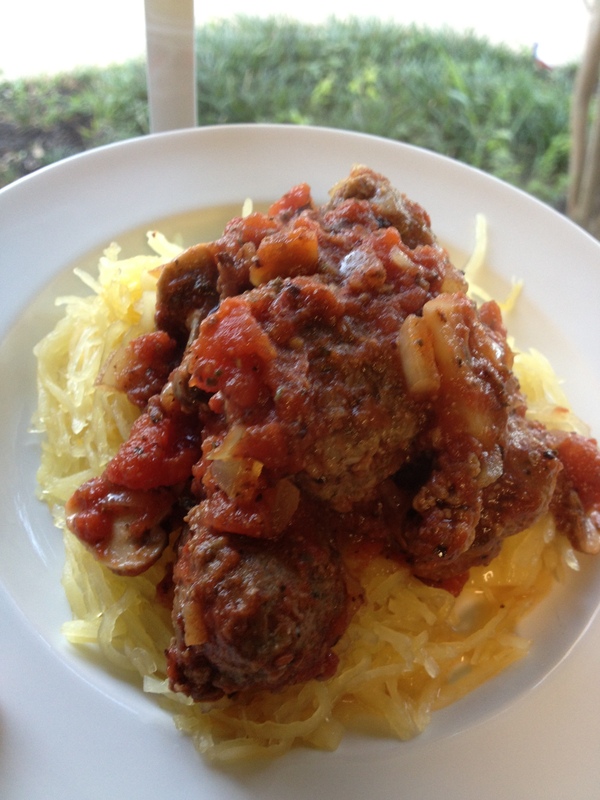 The spaghetti squash is a delicious substitute for pasta and much healthier for you. It’s worth the work, I promise! My goal is to make more sustainable meals that are healthy and promote a balance of nutrients from whole foods, free range and/or wild animals, and organic vegetables. 🙂 This meal happens to be gluten free and follows the “Paleo Diet” theme of you’re into that kind of thing. 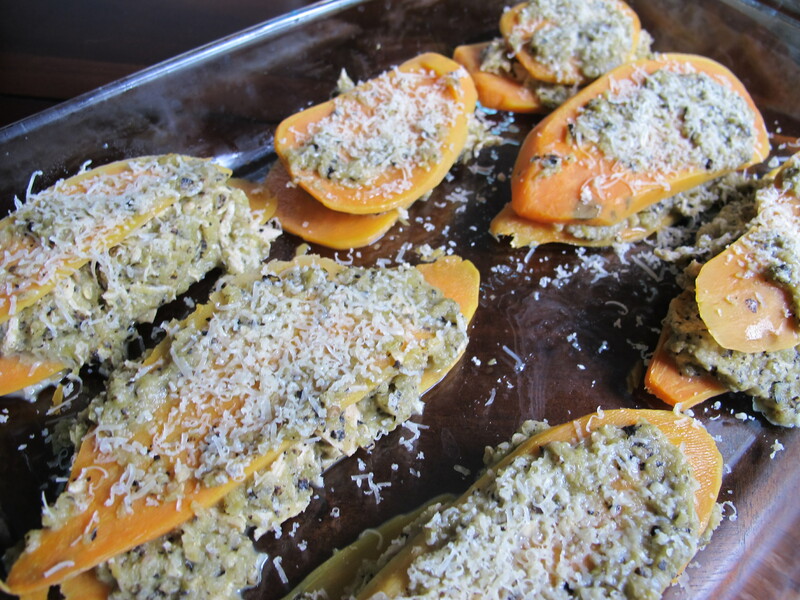 Serves: 3-4 (depending on how big your squash is). You can always make two just in case. You will have plenty of sauce and meatballs for 4 though. 2 TBS Basil and Pine Nut Pesto (I make my own but you can buy at the store). 1 tsp. Wild Garlic (you can sub regular garlic if need be). Mix well and form into 20 small meatballs. Cook in 1 tsp. of coconut oil until browned and mostly done. 26.46 oz Chopped Tomatoes, I use Pomi brand for ease of use and it’s not from a BPA can. 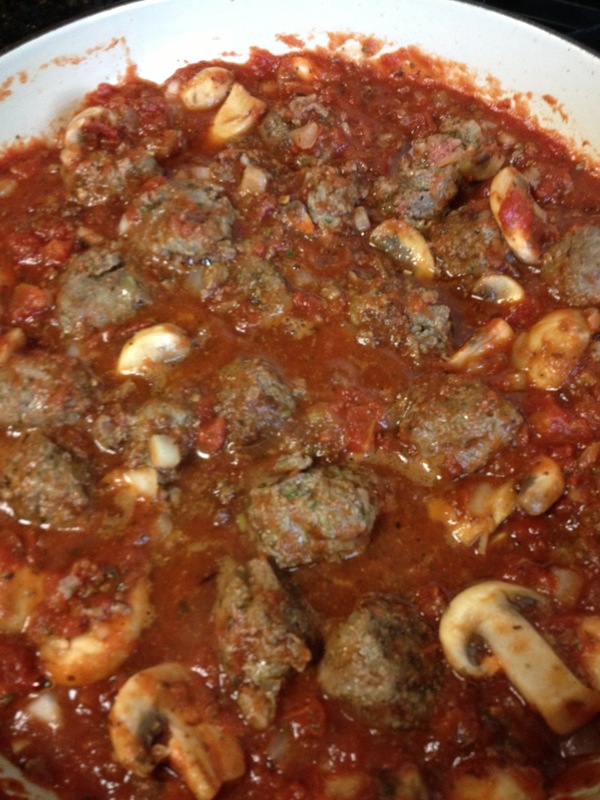 Take same pan meatballs were cooked in (a braiser or dutch oven works well) and add mushrooms and onion. Cook for 1 min. Empty tomatoes into mixture and scrape the bits of the pans from cooking meatballs. (This is great for flavor). Add spices. Simmer for 15 min. Add meatballs back in and simmer for 25 more min. 1 Spaghetti Squash, halved longways. In a large glass pan add 1/2 inch of water and a tsp of coconut oil. Place squash cut side down in water. Bake for 30-35 min or until tender. 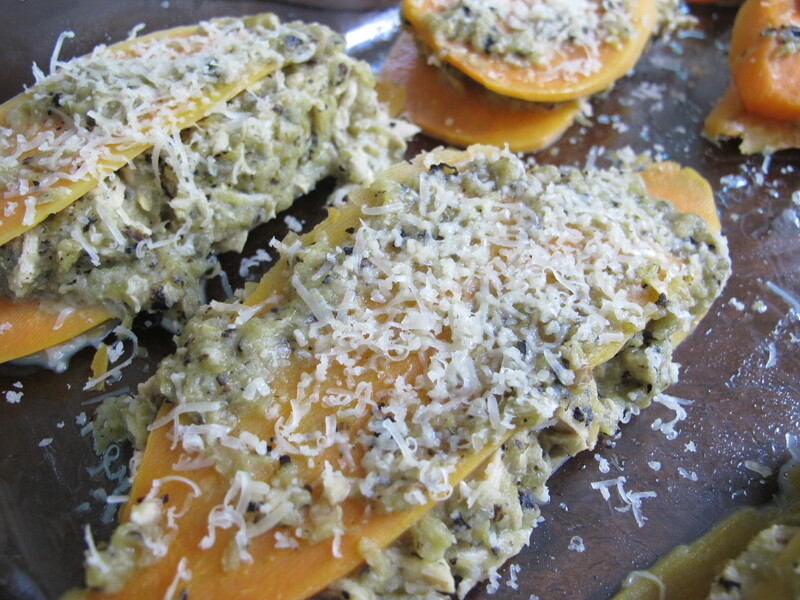 Scrape with fork across the squash ( it will look like spaghetti).